Palmeiras were a bit of a mixed bag against Millonarios from Colombia in yesterday’s first leg in the group of 16 in the South America Cup. At the Pacaembu stadium before some 7.000 spectators – actually not a bad number considering the day and time of the game and the focus Palmeiras and palmeirenses are giving to the Brazilian Championship – Palmeiras showed superiority and, as in previous games under Kleina, opened up the scorecard within 15 minutes. With Barcos serving his national squad and Assunsão a Thiago Heleno resting, we saw a starting eleven composed of Bruno; Artur, Maurício Ramos, Román and Juninho; Henrique, Correa, Márcio Araújo and Daniel Carvalho; Maikon Leite and Obina. Unfortunately, Leite twisted his ankle in the early minutes of the game and was substituted for Luan (in any case Leite will not play on Saturday against São Paulo due to suspension, but let’s hope for a speedy recovery). The end result, 3-1, was good but not great. 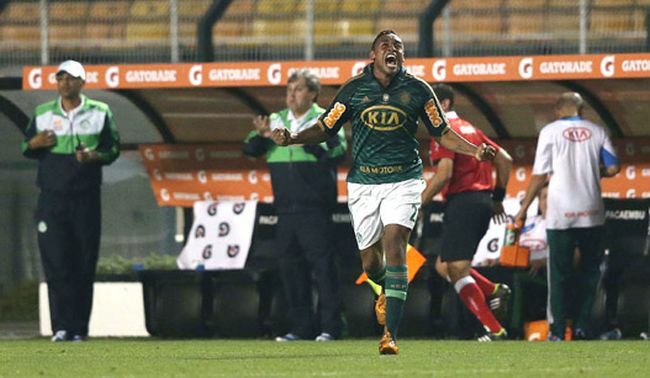 Palmeiras relaxed a bit too much, especially mid second half, and allowed Millonarios to apply considerable pressure. Bruno was terrific between the posts but was beaten by an unlucky own goal from Artur. However, on the whole, the team performed well. Román showed a lot of spirit, Daniel Carvalho has his best display in ages, both Luan and Valdivia (came on with 15 minutes to go in the second half) worked well offensively, stressing the opponent to commit mistakes. Kleina again showed he has a good grasp of the squad and all his substitutions aimed at turning Palmeiras more offensive. We like that. The return game takes place in three weeks’ time. Palmeiras can afford to lose by one goal and still qualify for the quarter-finals. As of today, the focus is back 100 per cent on the Brasileirão and Saturday’s derby against São Paulo. The three victories under Kleina have been against relatively weaker teams; this will be the first actual test. Maximum alert in regard to the referee picked for the clash: Paulo César de Oliveira has the worst possible track record against Palmeiras and in any serious country/football federation he would have been asked to clear off a long time ago. Expect penalties against Palmeiras, expect our players seeing the red card. Expecting anything.